As your child grows closer to 5 years in age, there are many ways you can still ride together. 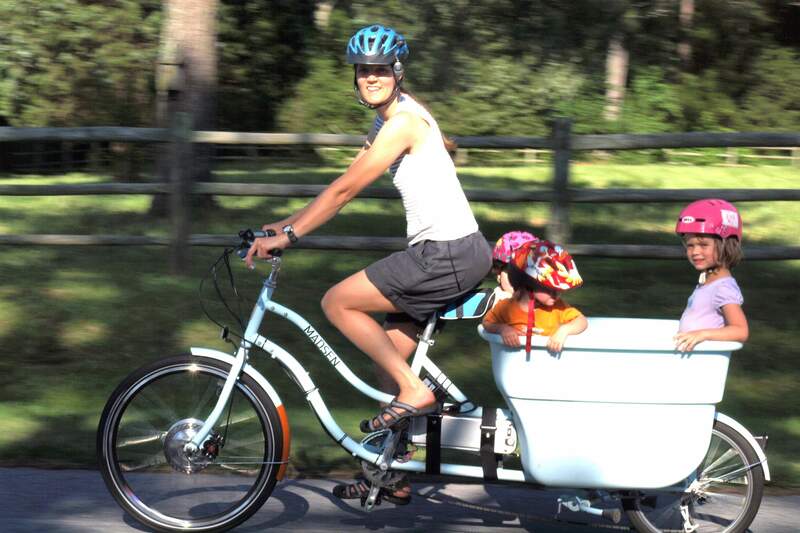 Having your child join you on a tandem, a tagalong, or a long bike will be ideal for long trips. Before taking a trip, make sure your child will stay awake and can sit upright. These options will allow your child to become more confident on a bike while riding with you at the same time. Cargo bike A "long bike" is an adult bike that has a long wheel base and a platform where children's handlebars and seats can be attached. Always be certain that your child can sit upright before riding with them. A tagalong bicycle attaches to the seat post on the adult's bicycle. Tagalongs allow the child to pedal along or to simply coast and enjoy the ride, while increasing their confidence on a bike. A bike tow-bar operates just like a tagalong but offers your child the freedom to bike alongside you after a quick disconnect.